MIGNONNE: Available Now - Three Amazing Pieces! 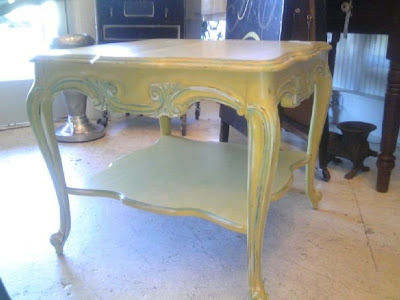 This little baby has been hand refinished in a golden ochre tone with blue and cream accents. It is solid wood and would be perfect in your living room or family area. It has a bottom display shelf. It would also work nicely as a bedside table. The curvy legs and carving detail make it even more special. Available now for $195. Wow, what a conversation piece! Eight feet, eight inches long, repurposed in blue with light distressing. Seat a crowd in your open kitchen or dining area ... imagine it on the terrace or in your garden! 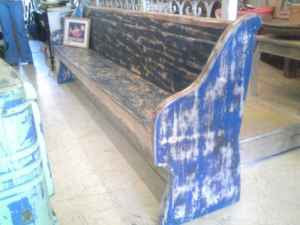 If you are a restaurateur ... wouldn't this make an amazing entry bench or community table seating piece? Saved from a local bay area church, this is truly something special. Yours for $695. Gorgeous revamped hutch, roomy and divine. It is solid redwood, and is an original built in from a Bay area home. 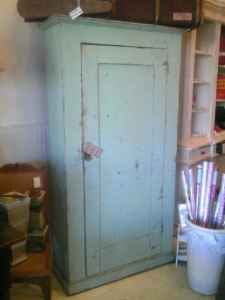 Open the front door to reveal built-in, removable shelves, it retains the original paint, which is a minty/sage green. It has been sealed with a top coat, making it an easy piece to clean and wipe down. This piece would be darling in a kitchen as an additional pantry, hall/living room to hide away papers etc, or style up your home office. Could also work well in a bedroom to store additional clothing etc. Snag this treasure for $550. As you know, Mignonne specializes in furniture revamping. You can always bring in a piece of your own and we can charge just for the custom repurposing service! Don't forget, now you can find us at the Alameda Antique Fair as well, on the first Sunday of every month at booth V22. We will be sharing a selection of our furniture and other finds at affordable prices.